Product information "FPGA Module with Xilinx Artix-7 XC7A35T-2CSG324C, 2x50-pin header, 3.5 x 7.3 cm"
The Trenz Electronic TE0725-03-35-2C is a low cost small-sized FPGA module integrating a Xilinx Artix-7 35T, 8 MByte HyperRAM and 32 MByte Flash memory for configuration and operation. 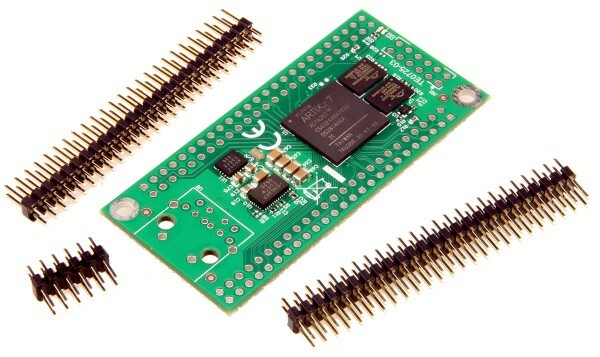 The 2 x 50 pin header with a 2.54 mm standard pitch fits perfect on a prefboard. Related links to "FPGA Module with Xilinx Artix-7 XC7A35T-2CSG324C, 2x50-pin header, 3.5 x 7.3 cm"